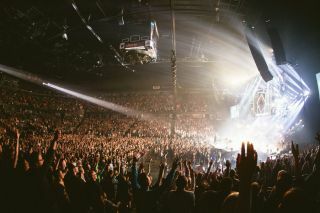 The initial spring leg of this year’s OUTCRY Tour sold out arenas and stadiums across North America thanks to a praiseworthy lineup of top Contemporary Christian, including Hillsong Worship, Kari Jobe, Jesus Culture with Martin Smith, Passion, Elevation Worship, Brian Houston and others. Packing 14 shows into 19 days with a roster of performers that frequently varied from show to show, the tour presented its share of production challenges in terms of both audio quality and basic logistics. However, sound provider Special Event Services (SES) of Winston-Salem, NC was ready for the task with its L-Acoustics K1/K2 PA system. But the biggest sonic challenge was neither the lineup nor diverse musical styles. Described by some as a touring Christian music festival, OUTCRY is best seen as the latest version of the traveling revival shows that have been a staple of American Christian culture since the early 19th century. OUTCRY has a rotating list of artists because the focus is not on the artist; rather, an OUTCRY show is a modern evangelical service with a worship band and pastor and scaling it up size and content-wise to fill an arena. Most of the artists on the OUTCRY Tour are actually worship bands in mega-churches across the globe, from Sacramento, CA (Jesus Culture) to Atlanta, GA (Passion) to Charlotte, NC (Elevation Worship) and all the way down to Sydney, Australia (Hillsong Worship). By gathering together, they were able to draw over 120,000 on this first leg of the 2016 tour alone. PA for the spring tour consisted of 12 K1 plus K2 per side for main hangs with an additional 14 K2 per side as audience sidefills. Low-end reinforcement was delivered by 16 SB28 ground subs, while six Kara provided frontfill from the lip of the stage. A total of a dozen LA-RAKs, each loaded with three LA8 amplified controllers, were called upon to power and process all loudspeaker systems.